Want to teach your Schnauzer some fun dog tricks? There are many different ways to teach your dog tricks. The good news is since Schnauzers are so smart and want to please their owners, you can train them to do lots of fun, cool dog tricks that will surely impress your family and friends. And since Schnauzers love to be the center of attention... they really enjoy performing, to boot. On this page, you will find the instructions on how to teach your dog to Sneeze, Go Back (or walk backwards) Sit Up, Dance, and Roll Over. Before we start, be sure to review our dog training tips. The most important thing to remember when teaching your dog new commands is to keep sessions short and fun for both of you. Be patient. Be consistent. And be sure to work with your Mini Schnauzer everyday in order to reinforce new learned commands. This trick always makes people laugh because Schnauzers have the cutest sounding sneezes and it makes their whiskers move about all over their faces. First grab some dog treats and a soft kleenex, or feather. Next, have your dog sit in front of you. Lightly tickle the tip end of his nose with the feather (or tissue) and just as he sneezes. Say SNEEZE, Good Boy! Then give your dog a treat. Repeat this process only 2 more times. Some dogs may get aggravated and or aggressive if repeated too often. So wait 30 minutes to an hour and then repeat the lesson. To further instill the command, every time you hear your Schnauzer sneeze normally, Say SNEEZE. 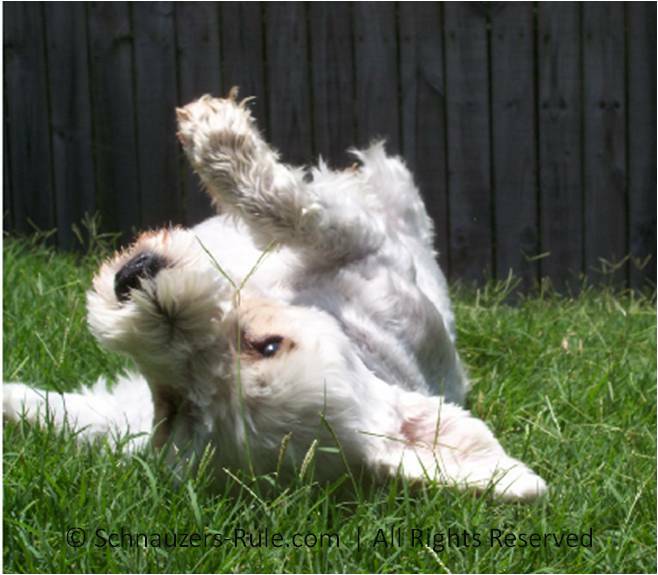 Getting your dog to roll over is a pretty simple and easy dog trick that most dogs can usually pick up in no time at all. What you need: Some dog treats or a favorite dog toy and your dog! First have your dog sit and then go into a down position. Next, place the dog treat or toy close to your dog's mouth but don't give it to him. Guide your hand holding the treat slowly around up over his head and back to the other side of the floor. His head will follow your hand and since in the down position, his body will automatically roll over to the other side. As soon as this action occurs command: ROLL OVER. Give your dog the treat and a verbal praise and then repeat then entire process a few more times. Once your Miniature Schnauzer begins to roll over more smoothly, get him to Roll Over by just using the verbal command. Say Roll Over in a light upbeat voice and give a circular hand cue if you like. Always be sure to treat and praise your Mini Schnauzer for a trick well done. Aroo! 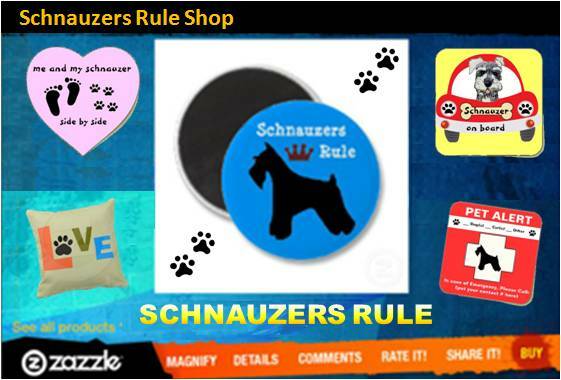 Who wants their Mini Schnauzer to sit up pretty for them? If you do this trick will do just that. A word of caution: Do not teach this trick to your dog if he has orthopedic problems as you would not want to place undo stress on their bones or joints. To teach your dog to sit up pretty first get a few dog treats ready and then have your dog sit and wait in front of you. Next hold a dog treat between your index finger and thumb just in front of his face and then raise it slightly above his nose and say SIT UP. With the treat a few inches above his nose, your dog will probably raise their front legs up off the floor in order to reach it. If your dog jumps off the floor or gets onto all fours for the treat, do not give it to him and begin again. Note: Some dogs need a little help in order to balance themselves. If necessary, raise his front paws for support and slowly let go. 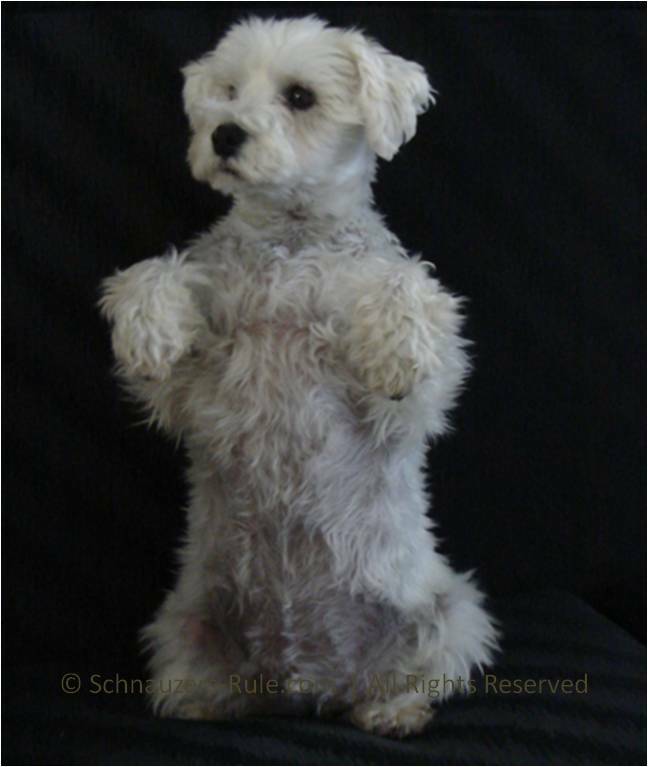 Say Sit Up, Good, Sit Up in a slow a steady voice so your dog knows to continue to balance on his hind legs. Wait 3 to 5 seconds and then give the treat. Remember trick training should be fun for both you and your dog, so don't over do it. Keep sessions short and upbeat. Getting your Schnauzer to DANCE is pretty easy to do and a really fun dog trick for both of you. Just hold treats high above your dog and out of their reach and as shown in this video, they will move about trying to get to it. Just say DANCE and have them move about 5 seconds before actually giving then the treat. You can also start adding other steps by having your dog mimic or mirror your actions. The Mirror Method is a type of dog training based on the concept that dog instinctively learn by following. This is done by actually doing the action yourself as you command your dog to do. For instance you spin around and tell your dog... SPIN. So you both spin at the same time. Teach Dog to WALK BACKWARDS: Before teaching your dog to walk backwards or Go Back he should know the HEEL COMMAND. If your dog knows how to walk with you going forward, it is a lot easier to follow your steps going backwards. Teach your dog to step backwards for 3 steps and praise. Repetitions are key to success. Teach Dog to GO BACK: If you want your dog to just back up or go back a bit, you can try this method: Go to a hallway in your home. Take some dog treats with you. ;) Have your Schnauzer stand in front of you. Now while facing your dog walk toward him. As soon as he steps back say, Go Back and treat. Walk slowly towards him again. Say GO BACK. When he takes steps backwards (at least 3 at a time) give him a treat. Reinforce the GO BACK command when you want your dog to back out of a room or back up away from you when you are carrying items or bringing in shopping bags. It's a good trick for dogs to know.